As responsible Parentosphere bloggers we’ve previously noted the bizarre celebrity fad for money as literal plaything. See this image of adorable Violet Affleck, toying with the weekend box office take for Daddy’s last movie. Well, the fad has spread even unto the Scientology Celebrity Center, and amid shocking, completely unforseen reports that Tom Cruise can no longer command $20 million a picture, we can see that the normally highly competitive Suri “Louboutins” Cruise has had to scale back from Benjamins to Jacksons as well. Ahhh, some of my fondest memories of camp were the new friends forged over endless games of “telephone” and dodgeball. To cement the relationship, a custom-made friendship bracelet was just the ticket. My friend would have me pick out the colors, and in a couple of days, I was the proud owner of a cute piece of jewelry that I would wear until it wore off. Or, until the friend made me mad and I cut it off with a pair of scissors. Whichever came first. The Los Angeles Times is claiming that friendship bracelets are no longer the domain of pre-teens mooning over their favorite singer on the cover of Tiger Beat. In fact, J. Crew will be featuring a $150 version in their upcoming catalogue. 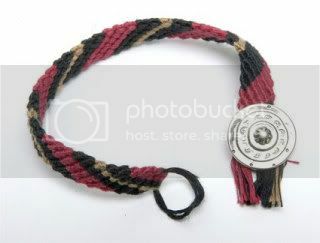 Along with countless games and accoutrements that previously belonged to only young people, adults have now seen fit to horn in on friendship bracelets, too. They are making them with semi-precious stones woven into the braid, or using expensive,fancy clasps. Is there nothing that children can have that is their own anymore? Are we adults so nostalgic, or so desperately seeking an infusion of youth, that we cannot leave anything in the past? Nex thing you know, metal braces with colored rubber bands will be the next big thing among the forty year old set. On the advice of counsel and having read the results of this quiz, I have no further comment at this time except to say it was not ME who squeezed from the middle of the tube. Also, I was buying toys for orphans at the time. You are very independent and self-centered. You don’t solve other people’s problems – and you don’t expect them to solve yours. Your idea of fashion is jeans and a t-shirt. Clean, if you’re lucky. In relationships, you tend to be very romantic and demanding. You’ll treat your partner like gold, but you expect a lot in return.